Trade Commissioner Cecilia Malmström has admitted she is worried about the increasingly negative attitude in the EU towards the trade talks with the United States. 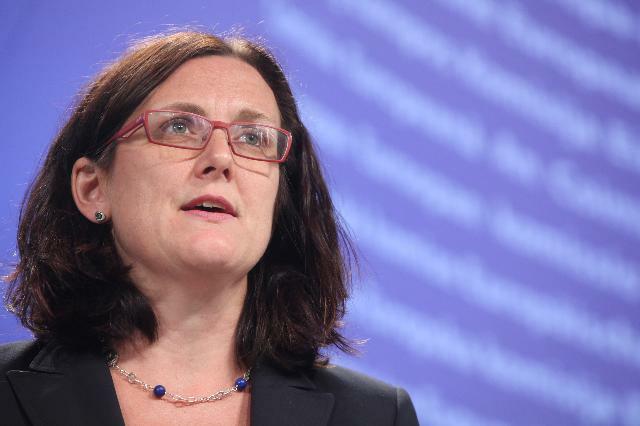 Malmström says it bothers her that the Transatlantic Trade and Investment Partnership (TTIP) talks, which began three years ago, are facing intense criticism in member states, despite the fact that the negotiations have a mandate from the EU-28. Last week, for example, a poll showed that 70% of Germans believe that a TTIP deal would bring “mostly disadvantages”, up from 55% in a similar poll in June 2014, with almost 80% of those questioned mentioning consumer rights as being the biggest worry. Ultimately, TTIP’s negative reputation in the EU comes down to heads of state not showing responsibility and defending the trade negotiations at home, according to Malmström. ”In this area, I don’t think they are doing enough,” Malmström said in an interview with Radio Sweden on Monday (9 May). The Commissioner lashed out at the French President François Hollande, who openly criticised the TTIP negotiations last week, stating that France would not accept the deal as it stands today. Hollande mentioned that an agreement could endanger France’s agricultural sector as well as undermine environmental principles. French Trade Minister Matthias Fekl meanwhile accused the US of not wanting to compromise. ”I note that it’s the beginning of a general election campaign in France and then it’s always fashionable to hit trade issues,” Malmström said. ”But the French government has not in any way asked us to suspend the negotiations. This criticism was never brought to us in any way,” she added. Last week, Greenpeace published 248 leaked pages from the latest trade negotiations in New York, revealing the US position. EU health and consumer rights organisations told euractiv.com afterwards that the leaks showed that the American negotiators don’t appear to respect the EU’s ‘precautionary principle’ in risk management. This would make regulatory cooperation more difficult, they said, unless the bloc agrees to water down a lot of its own safety standards and legislation on consumer rights, food safety and public health. 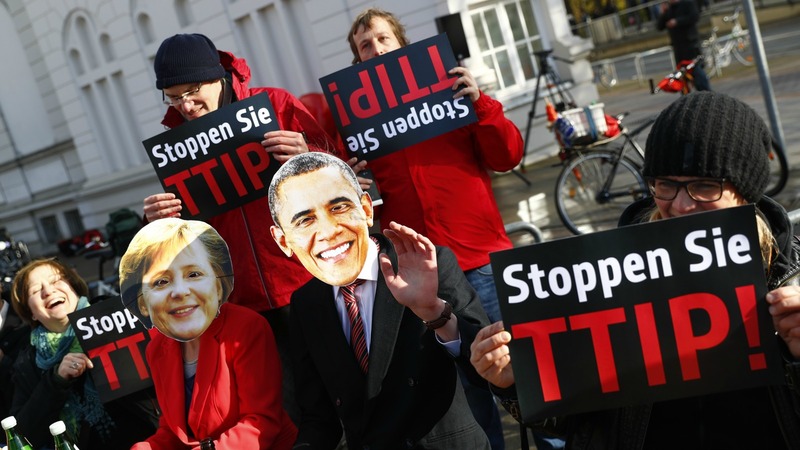 The leaked documents of current US positions in the ongoing transatlantic trade talks have made health and consumer rights organisations wary that EU legislation could still be watered down under the agreement. July 2016: 14th round of the transatlantic trade negotiations begin in Brussels. The article that claims no problems with TTIP is vague and leaves even more questions as to why if all these trade agreements are really that trade-related and/or do have any interest in seeing benefits and growth for the very people who consume the trade items marketed,—then why all the secrecy, solely targeted to exclude taxpaying citizens. Its as though indifference and class has finally become acceptable and thus lying and hiding the real affects of taking control over taxpayers while null and voiding all adherence to constitutions and the rule of law…..See bilaterals.org for total content and analysis of all global trade deals, NAFTA, CETA, FIPA, TPP, TTIP, and the worse of the worst TISA. Which not only was negotiated in secrecy, but plans to be deceitful in implementing a 5 year public non-disclosure clause will institute huge risky system changes in governments, too late for taxpayers to realize they are being scammed. These changes will transfer ownership/control to make instant public pensions into private ones, education would also be privatized as would healthcare-Leaving–little done to ensure public protected lands or waterways are of any real concern,as corporations are to be left in control, as owners to extract any price or fee increases as they see fit……Again, see bilaterals.org for details and affects……Little would be left as Greece clearly shows, of any semblance of a functioning healthy domestic market with vital small to medium-sized business…..in nation-states…(countries). Read https://en.wikipedia.org/wiki/Cecilia_Malmstr%C3%B6m to see why with this lady leading the EU team we should all be afraid. That is just “IT” , the EU is a law unto itself , not representative of Member States , or the People of Europe ! 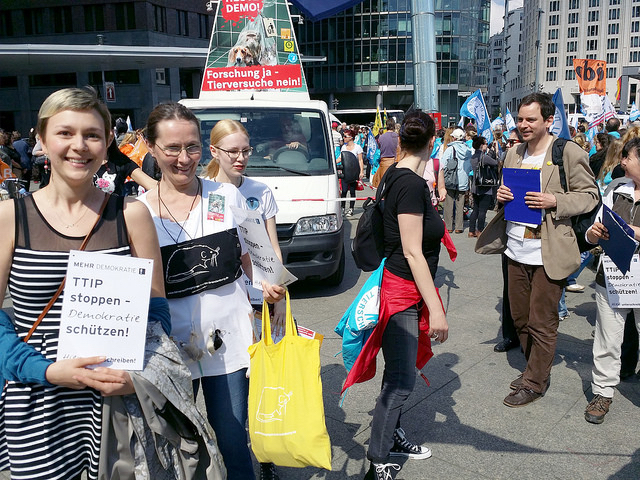 I am among many very fearful of TTIP , leaving aside the trade , the fact that Corporations , ( like Monsanto Always in Litigation ) may sue European governments that might block their activities ; that all arbitration or legal proceedings be conducted in US courts . What worries me even more is that the EU doesn’t have its own foreign policy that is not dictated from Washington . European foreign affairs are under the control of Washington ; now Europe is negotiating an US/EU free trade treaty , that would tie European trade to the US . I do not want to see Europe completely in the control of the US . ITTP is a very dangerous political move that could rob Europe of any independence of thought , to differ from the US for fear of a trade malfunction or retribution . The Public are quite rightly concerned as they have no visibility of TTIP and question the integrity and expertise of those negotiating the EU position.